I hope when the new IFTTT is released the delay is gone. +1 for Ring support direct on homey. I'm now using ifttt but sometimes it takes more then a minute that homey tells me someone is at my door. Ring does not have an open api yet, so supporting it native is kinda hard at the moment. But do you have delays on ifttt and ring? Have it for more then half a year connected to homey. and it always looks if its realtime. The ifttt connection ring has is superfast for me. Ring (Pro) is a very nice product. If it is a non open api, Athom could step in to get the b2b relation in place. Would love to see that happening. Today friend visit me and after 5 min homey tells me someone is at my door ARGHHH. i found someone who found the API info on the internet. Wowww would be really great if someone could make a homey app for it much better then IFTTT. Anyone knows how they prevent this very expensive toy from not being removed/stolen from your front door? It seems to be installed with 2 simple screws from the outside? Ring (the company) will block the Ring Doorbell (mac address) and the owner / Ring will have a video. Nice product, too bad it seems you can only record to their cloud (€€€) and not to a local NAS. Yes. With our optional Cloud Video Recording service, all video footage and audio recordings captured by your Ring Doorbell is stored in our secure cloud servers for up to 6 months from the date of the activity. You can access and download these videos anytime with the Ring App or online at www.ring.com/account/activity. Ring Doorbells are not able to send videos to network attached local storage. All Ring Doorbells come with a 30 day trial of our Cloud Video Recording service that activates automatically when your Ring Doorbell comes online. After the thirty day trial period, optional Cloud Video Recording subscriptions are $3 USD/month or $30 USD/annually for each Ring Doorbell. Just wondering. For 3 dollars per month how long do these backups retain? I used to have a RIng (hardwire connection) and it was possible to see the recordings without a cloud VR service (maybe online for a short period - did not check). Now we have the Ring Pro and use the trial cloud sevice. After the trial I probably will not get the cloud service if I have the same functions earlier available with the Ring and invest some time in discovering what Ring-IFTTT is able to deliver. It’s actually 2.5 dollars a month and there are coupons around which even make it drop to 1.5 dollar a month. The nice thing about the cloud solution is the easy way i can look back from wherever i am. Coupons?? Do you have a link? 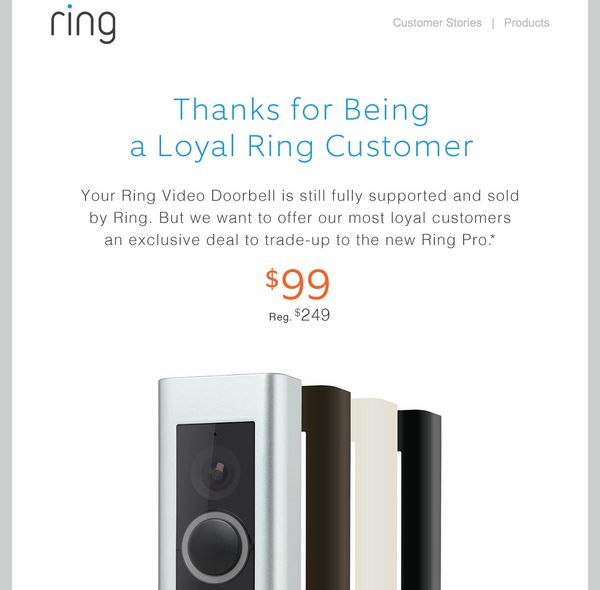 a few weeks ago I received an offer from Ring: the Ring Pro for $99. No idea, it was an email from Ring. I contacted the support desk of Ring, there is going to be support for recording to a NAS in the future. @hnijveen Do you have a promocode in this email? I contacted Ring and they told me to use it. No promocode. An in email button - url to log in to an existing Ring account to be able to order the Ring Pro. Didnt get the email, have a Ring, and want to order one. Can you place the link? pm me with your email address, I will forward the email - no guarantees ofc.